Melt butter in heavey 2 quart soup pot. Add onion, garlic and mushrooms. Cook over medium heat until onions are transparent. Remove from heat. Blend in 3 tablespoons flour. Return to heat and add chicken broth. Cook and stir until thickened. Add additional 1 tablespoon flour and seasonings to Half & Half , then stir the mixture into the soap. Heat to thicken. Makes about 5 cups of soup. I use puffball mushrooms (when I am able) to make my mushroom soup, but any sort will suffice. When the mushrooms are ready to pick my son brings them to me. I brush off any dirt, trim away the stem and then dice the flesh of the mushrooms. I saute’ them in butter and freeze in quart bags to make this soup later in winter when I want something warm and delicious! Back in 1972 I was just shy of 18 years old, a city girl engaged to marry a farmer. Jim and I were in the process of updating the hog shed on the farm we had just purchased. The building was in grave disrepair. The previous owner had kept fattening hogs in the shed and had let the manure build up, causing the wooden posts to rot away, which caused the ceiling to begin to cave in. First we had to pitch out the manure. The shed measures 12 by 24 feet. There are two stone steps down into the shed through a narrow, short door. A skid loader for this job was out of the question. It took the two of us several days to pitch it out by hand. Once the area was clean we started restoration and redesign. At the time we were raising hogs. Farrowing was to take place in this location. 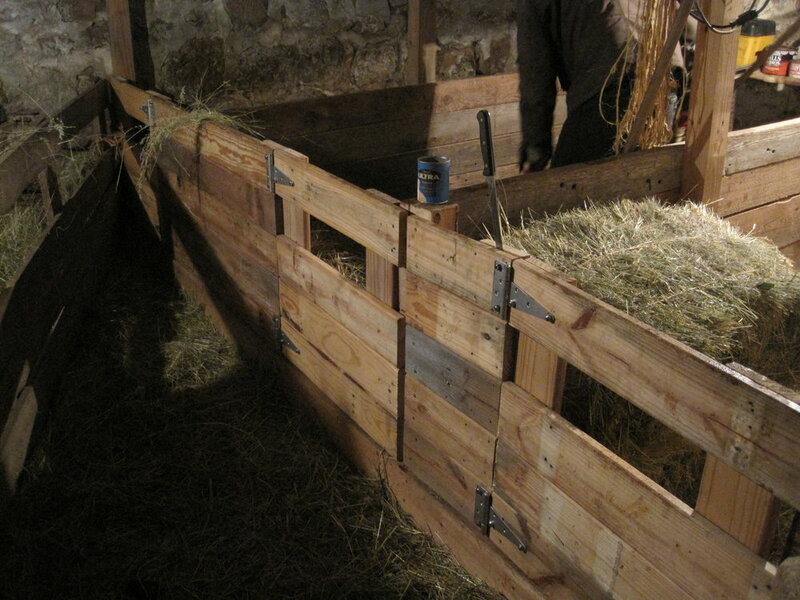 That meant building farrowing (birthing) stalls for the sows and incorporating creep feed areas for the baby pigs. The concrete floor had quite a few holes broken into it so we had to repair those areas before we could install support posts. Jim was farming in partnership with his parents at the time, so the only time he had to work on this project was late at night. I was working at Monarch Range in Beaver Dam as a secretary during the day. I did not have a driver’s license until I was 25 years old (another story) so Jim picked me up at my dad’s house on Lake Sinnissippi in Hustisford every morning and returned me home every night after we did chores on the farm. Late one Friday night we decided it was a good time to fix that concrete floor in the hog shed. We mixed the concrete ourselves using a wheelbarrow and a hoe. You just pour the concrete into the wheelbarrow full of gravel, add water and mix with a hoe until it looks right, then push the wheelbarrow to the holes in the floor, pour and level off, smoothe it over and move on to the next spot. 45 years later we are again restoring the support posts in that shed, this time for sheep. 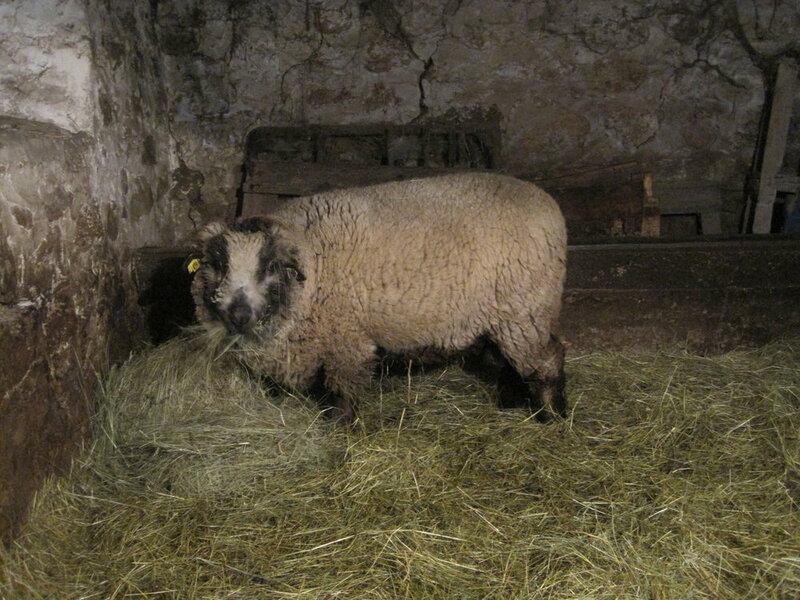 Last spring my ram got into a mood and butted every gate, post and sectional wall in that shed. Nothing remains as it was. We built a new door for the shed this past summer, since that too, was smashed by my overly excited ram. Rolo, my beautiful, but sometimes overly excited ram. 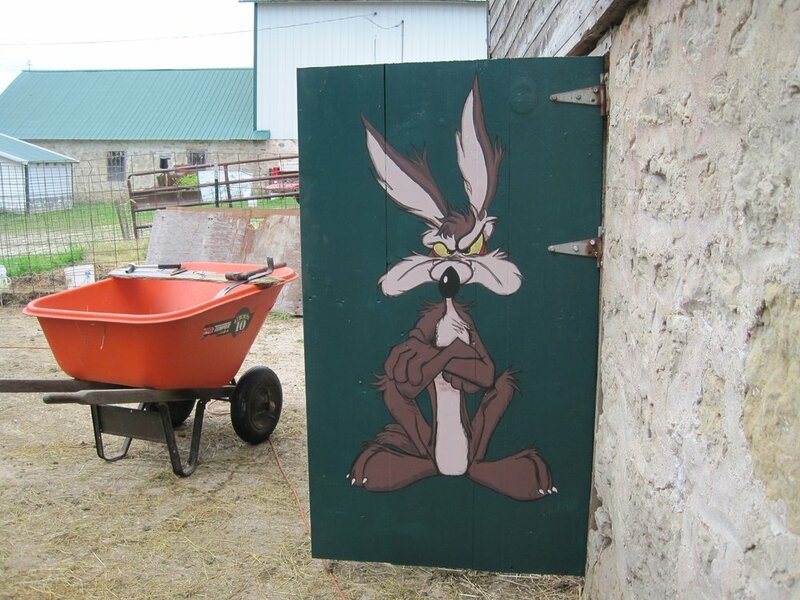 I painted Wile E. Coyote on the outside surface of the door just because I could. We have about four months’ time from now (mid-January) before I expect new lambs. We would like to have the new lambing pens finished by then. One forkful at a time, we pitched this pile of manure out of the sheep shed. Late last summer together Jim and I pitched the sheep manure that had built up in the shed over the past year, again by hand. We clean the shed only once a year, usually in the summertime, because a build-up of manure for the winter helps to keep the shed warm for the animals. I have only four ewes and the ram now, so there isn’t much build-up yet. Currently we have the sheep using one half the area in the building so that the space we intend to redesign is kept clean for us to work. Note the damage done by Rolo. There was once a support post in the center of this view. New gates, pen walls and posts, all constructed of salvaged lumber. The old pens were built for sows using one-by-six boards (as was the old door). This time we will use two-by-twelves (as we did for the new door). On the upside, chances are pretty good that we have the lumber we will need right here on the farm. I married a salvaging packrat who was raised by salvaging packrats. Nothing goes to waste. If it is made of wood and is no longer in use, you take it apart, pull out the nails and then store it in the lumber shed. We are now the third and fourth generations of the same farm family on these farms. There is alot of salvaged lumber in that shed. If you don’t see exactly what you think you need, you simply make something else work. Fast forward a month. We have pens and gates built. Thank goodness we started early because that ram must have sneaked in to visit the girls when I wasn’t looking. Our first lamb was born on February 1. The second one came on February 20. The new pens were bedded and ready to receive their tenants in the knick of time. I keep four ewes and the ram, so I may have a few lambs coming yet. We’ll see. First lamb of 2018, born February 1. Mother and baby are doing just fine. Springtime brings lots of new arrivals here on the Zahn farms. Our younger son, Rudy, hatched 26 chicks in his home as a gift to Jim for his birthday. Our older son, Jonas, purchased 40 more chicks to add to the mix. Since both broods are straight run, chances are good that they are 50% male, 50% female. We will raise the females and keep them to lay eggs for our families. The males, except for one, will eventually be chicken dinners. I like to keep one rooster because they tend to protect the hens from danger. A good rooster will crow when there is danger, causing the hens to run for cover in their coop. 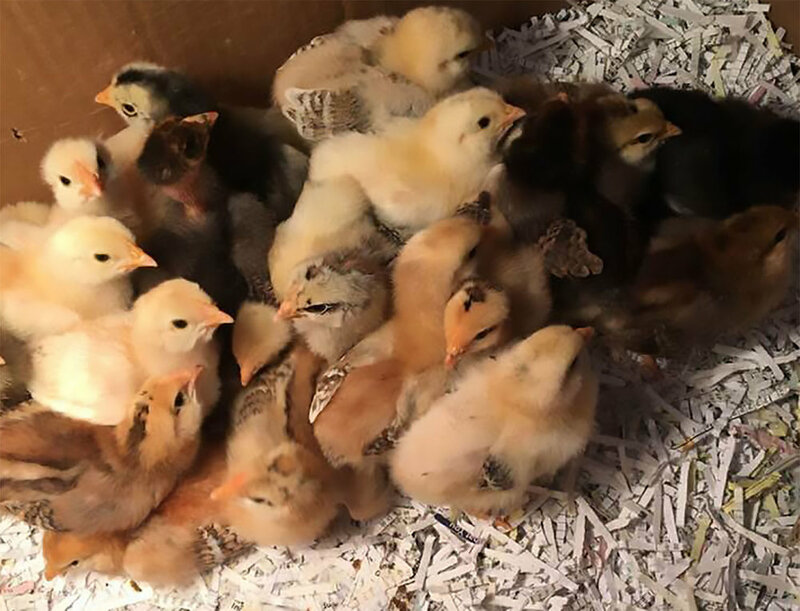 These chicks are just a week old. And that, as they say, is the news from home for now. ∗ Sprinkle my bathsalts on carpet, rub in with a soft broom, then vacuum to remove odors! ∗ Use any of my bathsalts to soften your bath water, prevent bathtub ring and keep your tub sparkling clean without need for scrubbing. They make your bathroom smell wonderful, too! ∗ Use my Morning in the Woods soap to keep your fingernails clean and repel insects while gardening. Scrape nails across the bar of soap to fill the gap under nails before your get to work. Clean-up is a breeze. Assemble ingredients. Get out the blender. Go! 1 medium to large orange (with thick rind) cut into 8 parts. In blender, pulse 1/2 cup sugar with half of the orange pieces (rind on) until completely chopped. Add half of the cranberries (frozen) and pulse to blend until completely chopped. Pour into bowl. Repeat. Add sugar to taste. 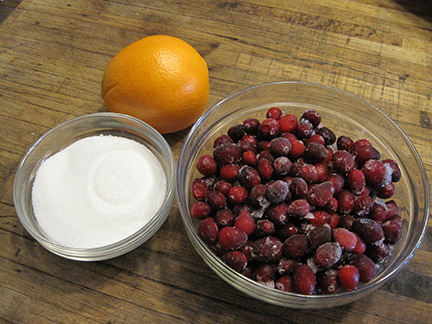 This cranberry sauce is so easy to make, tastes wonderful and freezes very well. Forty years ago in November of 1977 I made my very first batch of soap. Our baby girl, Sara, was just three months old at the time, and she had been born with a skin disease called seborrhea. It made her skin dry and non-elastic. Everywhere she moved her little body her skin cracked and bled. Though we took her to see our doctor time and time again, nothing he prescribed seemed to help her. Then a wise old neighbor farm woman suggested to me that my baby might be sensitive to commercial soaps and detergents. She gave to me a bar of her stinky old-fashioned laundry soap and told me to wash my baby and everything she wore or touched with it. After three months of doctoring and prescritions, I was ready to try anything. I did as Dorothy suggested and in one week my baby was normal! I learned to make that stinky laundry soap with fats saved from cooking roasts and making soups and stews. It worked for Sara, but it smelled awful. I wanted to learn to make pretty, nice smelling soaps. Forty years ago there were not many options available to someone wanting to learn this skill. There was no internet. Our library in Juneau, WI did not have much on the topic. I researched old books in a library in Milwaukee and I learned about the rules of chemistry involved in soapmaking, as well as the history and a few old wives’ tales. I learned enough to develop my own recipes. The first successful one was my Fresh Meadow Soap, which is my best seller to this day. It is one of five healing soaps I now make for people who have sensitive skin. The most important ingredient is chlorophyll, which comes from plants and promotes healing. Sara still uses my soaps exclusively, though there was a short learning curve when she was in her teens and wanted to try something else. Almost immediately her skin broke out in a rash when she tried a commercial soap. Needless to say, she is my oldest, most loyal “customer”, though she gets all the she needs in exchange for a kiss and a hug. When word spread locally about how my soap had helped Sara, others asked to buy some for their loved ones who had skin problems. I had a nice little home business going to make a little pocket change. I had three children, a husband, a garden, cows to milk twice a day, some sheep and chickens. Life was good. Then, sometime in the early 1990s, a local freelance journalist interviewed me about it. Her article was sold over the associated press. Several small town newspapers across the US published the story. I got a few letters in the mail, a few requests to buy some soap. Now I had a mail-order business. Everything was primitive. I saved cereal boxes in which to package and mail the soap. I asked family and friends to save their boxes, too, when the need arose. In 1993 the Milwaukee Journal published a story about my soap business on the front page of their business section. As a result, I got 10,000 letters in the mail over a period of a few weeks. I had no computer. I asked Jim (my husband) if he would help me to answer all those letters asking for my recipes, to buy soap, or if I would come to teach them to make it. He told me “no. You got yourself into this mess, now you can get yourself out.” I answered every one of those letters by hand. When I was finished, I had a little bit bigger business. By this time our children were in highschool and university. They could help out more on the farm and I could do more with my business. I made enough money to remodel my kitchen and to buy a pipeline milking system for the barn so I didn’t have to carry the milk from the cow to the bulk tank anymore. Again, life was good. The editor called me back a day later and said that the most mail any business woman they featured on their cover had received was 6,000 letters. Since I had already handled 10,000, I should be good to go. So I agreed to go ahead with the plan. They sent out a photographer to take pictures on the hottest day we had in August of 1994. We had no airconditioning at the time and those lights were hot. I had to have three changes of clothes ready in colors they specified. The shoot took 12 hours over two days. The interview was done by phone, and what I said is not what they wrote, but there it is. They did get my name and address right. March 1995. Check out the hair do. In March of 1995 the first copies of the issue hit the magazine stands. One day I got 50 letters in the mail. I was thrilled. The next day I got 75, then 200. The fourth day of that week the post office called to say the our carrier couldn’t deliver our mail. It didn’t fit in his vehicle. Soon after that the number of letters reached 5,000 per day and remained so for weeks. Jim had to get our mail with the pick-up truck every day. Now think about that. One person cannot open and read that much mail in one day. Soon our living and dining rooms were stacked five feet deep in post office mail bins. We lived that way for more than a year. The total pieces of mail that year topped 250,000. Our children helped, my mother-in-law did our laundry, friends did my cooking, cleaning and baking for me. I finally did get a computer, but it was just an Apple 2Gs. I had a dot matrix printer. I could print only 500 one page (1/4 folded) catalogues per day and the sound of that printer was very annoying. (Jim did not sell the cows.) I designed a catalogue and had Econoprint run them for me. Then I realized that for what I paid them to run my brochures, I could own my own machine, so I bought one. I had to learn to do everything I was doing on a much larger scale. I did. I still do. Things have settled down quite a bit. This business helped us to pay for the farm and fix up our house and helped us to put the kids through school. We paid for a few weddings in there, too. Once again, life was good. Check out thesoaplady.com online, if you haven’t done so. I rebuilt my website earlier this year and I am rather pleased with it. Let me know what you think. I have been making, cutting and trimming soap to stock up for what I hope will be a good holiday sales season. I have washcloths in weaving progress on the loom and a good sized pile of washcloths and towels sitting on my work table, waiting to be hemmed. Soon I will get to work making my annual discount postcards and get them out in the mail to all of my loyal customers. Over the years I have enjoyed getting to know many of my customers when they call or write to order from me and include a little personal note to tell me about their lives. I appreciate each and every one of you! And yes, life is still good.